Ryder System, Inc. (NYSE:R) , a leader in commercial fleet management and supply chain solutions, today announced that it has been selected as the outsourced fleet provider for Howdens Joinery, one of the U.K.’s leading manufacturers and suppliers of kitchens and joinery products. 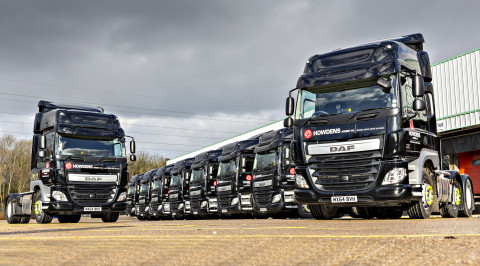 Howdens is replacing its existing fleet with 100 heavy duty, Euro 6 compliant tractors, under a full service lease from Ryder. Euro 6 is the latest diesel engine emission legislation being driven by the European Commission. The new vehicles feature high-tech specifications including lane departure systems, adaptive cruise control, forward facing cameras, and on-board telematics. The vehicles will operate across Howdens Yorkshire and Northampton distribution hubs and its four regional transportation hubs, delivering to nearly 600 trade depots. Ryder is a FORTUNE 500(R) commercial fleet management and supply chain solutions company. Ryder’s stock (NYSE:R) is a component of the Dow Jones Transportation Average and the Standard & Poor’s 500 Index. Inbound Logistics magazine has recognized Ryder as a top third party logistics provider and green supply chain partner. In addition, Security Magazine has named Ryder one of the top companies for security practices in the transportation, logistics, supply chain, and warehousing sector. Ryder is a proud member of the American Red Cross Disaster Responder Program, supporting national and local disaster preparedness and response efforts. Ryder Europe was established in 1971 and has grown through acquisition and organic development into a sizeable force in transportation with a fleet of more than 22,500 trucks and trailers. The European business focuses on commercial vehicle rental, contract hire and maintenance operating from 29 locations with dedicated delivery solutions operating across a further 23 locations. For more information, visit www.ryder.com and follow us on Facebook, YouTube, Twitter, and on our Online Newsroom.